It’s the last night of October…some call it Halloween. The crisp air and the snowflakes are just around the corner. The experience of our product and how it makes someone feel is what matters. We don’t believe in dumb luck or happenstance. We spend a lot of time reflecting, deliberating and discussing a few things. We are craftsmen, artists and inventors. Everything we do has our rink builder in mind. It’s all about strength, versatility, durability, functionality and you see it in everything we do! Sign your work with personalization and customization, we do because it means everything to you, and it means everything to us. 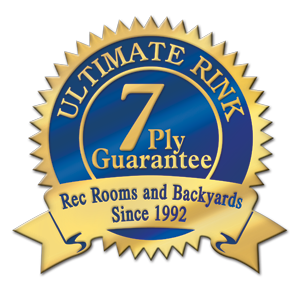 “Real Rinks for Real Yards” Get the Ultimost From Your Ultimate. Just like you, we are outdoor enthusiasts and have made ice rinks both our passion and our profession. Our website launched in 1994 by our founder, Brian Young, and we have been industry leaders in innovation and service ever since. We enjoy bringing families together for quality time right in the comfort of their own back yard. We are parents ourselves and our children have grown up with the family in the backyard gathered around the fire with the rink there for all to enjoy. Nothing like the cool wind on the face and seeing your breath and the opportunity to eat toasted marshmallows and hot dogs while the game is on just to the left. Fantastic! Get the Ultimost from your Ultimate. Brian’s vision to supply homeowners with the tools and supplies to create their own ice rinks came to fruition because of his own struggles in creating one in his backyard when his children were young. When he was building it, he had a hard time finding equipment and instruction that could help him set-up his ice rink both quickly and easily. Quite simply there was nothing available. We were the first to offer personalization with Board Banners and Center Ice Art. 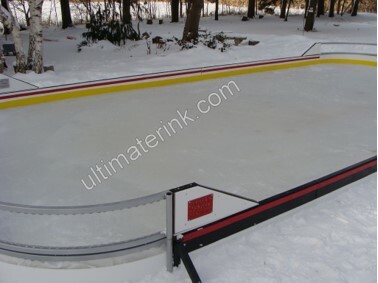 We were the first to offer Solar Ice to protect your Center Ice Art from Solar Melt. We were the first to offer Corner Seats in four different colors. We were the first to offer PuckGoRounds in three sizes for an instant round corner. We were the first to offer colored Support 45’s to hold back deep water and match your favorite team and your rink in the process. This is often a big struggle for backyard ice rink enthusiasts because they have difficulty dealing with a slope in their yard. We were the first to offer multi functional rink stakes (our 5 in 1 Rink Stake J-Brace) that are flexible enough to do many different jobs allowing extreme flexibility in the building process. Nothing like Rink Freedom. 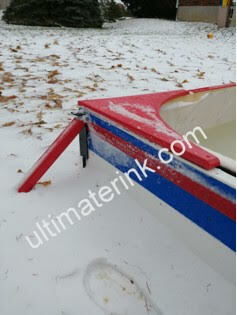 We were the first and only supplier of 7 layer technology rink poly. We were the first to offer corner systems for outdoor rinks can be used to generate advertising dollars or shout out your name as the coolest rink in the community and that also incorporate a rope lighting system for night time use. We were the first and still the only ones that offer a liner protection system for your entire rink in four different styles depending on your passion and budget. We were the first to offer Liner Protection around your entire rink in a premium rink system set up. This is represented by our TRUC Corner System and TRUC Board System. We were the first to offer items with fast set up time/tear down times now recognized as “Presto Install” items. We were the first to offer Sill Bands, Sill Caps and Kick Plates to allow you to continue to personalize and customize your very own masterpiece. Brian Young founded the Ultimate Outdoor Rink in the early 1990’s in Stratford, Ontario. He has a unique zest for life. His excitement for the outdoors is contagious and translates into all of the products both on the website and in the service he provides over the phone and via email. He is to ‘go-to’ for assisting in slope issues, rink liner sizing selection and for everyday questions about how to build your own outdoor rink. Often Brian is called a backyard rink guru because of his knowledge after more than a quarter of a century of building, maintaining and thinking rinks. 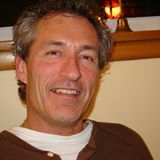 He has experience with rinks on slopes, in windy areas and calm quiet backyards and yes……there is quite a difference. You would not believe it. Brian knows! During the summer months, Brian redirects his energies towards his Party Supply store in Stratford. He enjoys renting out bouncy castles, inflated water slides, dunk tanks, Sumo Wrestling Suits and wedding décor. In his spare time, Brian enjoys spending time on his own backyard rink, playing Frisbee and fishing and exploring the great outdoors. Recently he and his girlfriend have taken up fly fishing. Brian’s son, Jeff, is studying in the IT field and has Graduated from The University of Western Ontario as a Mechanical Engineer. He is famous for his first year project where he built a Magnetic Levitation (Mag Lev) train after his prof suggested it couldn’t be done. His daughter, Kelsey, has a passion for all things equestrian and has started her own business decorating weddings and supplying special events in the Hamilton area and the G.T.A. in Canada. Go To http://www.kayware.com/ Both enjoy helping him with the Party Supply and online Ultimate Outdoor Rink stores. To connect with Brian or his fabulous team of professionals for a question about your outdoor ice rink, simply email rinks@rogers.com or call 1-800-448-6648.